"So what is this game?" Seems like a simple question, right? Usually there's a simple answer: "It's a platformer where you save the princess by jumping through deserts and oceans." "It's a sci-fi shooter. You blast away aliens." "High-school simulator meets dungeon-crawler." Far Cry 3 is a little bit harder to define. Maybe that's why I like it so much. I started playing the third Far Cry over the weekend, and although I haven't gotten very far just yet—I've played maybe three, four hours?—I'm already in love with the Rook Islands and all of the things you can do there. 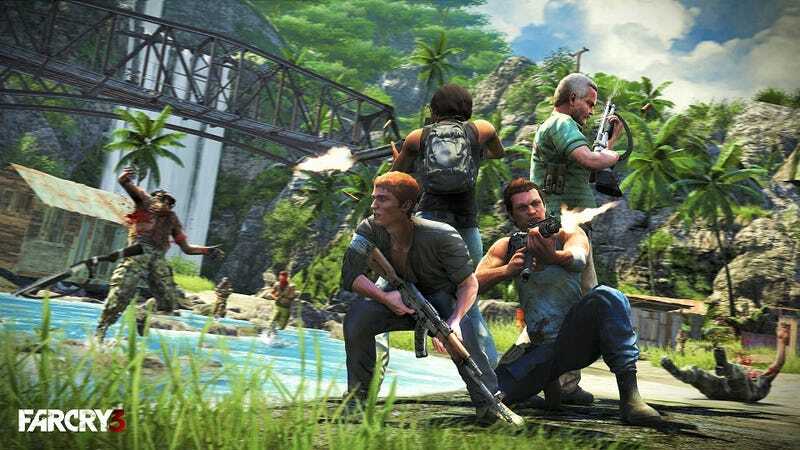 Kirk already did a great job describing the feeling of playing Far Cry 3 in his review, but I wanted to write up a few quick thoughts of my own. What I like most about Far Cry 3 is that it defies video game genre. It dodges conventions. It's not just an open-world adventure, it's also a shooter. And an RPG. And a stealth game. And an animal hunting simulator. Some have called it Skyrim with guns, but I think it's really more than that. Far Cry 3 is Skyrim with guns, and paragliders, and skinning, and driving, and boating, and tigers, and drug trips, and no draugr. It's a game where you can sneak up on enemies and silently snipe them with a crossbow, or explore the jungles of a LOST-like supernatural world, or just run around with an assault rifle blowing up everything you can see. It's a game that defies and combines genres to the point where it becomes something unique, something unlike just about any other game out there. And in today's gaming world, where marketers and business executives are constantly looking to stick their games with catchy little subheads—"it's Call of Duty meets Dragon Quest, you see! "—I love seeing something that shies away from convention. Even if there is a little too much dubstep.